This product guide provides essential pre-sales information to understand the Lenovo Flex System SI4091 10Gb System Interconnect Module, its key features and specifications, components and options, and configuration guidelines. This guide is intended for technical specialists, sales specialists, sales engineers, IT architects, and other IT professionals who want to learn more about the SI4091 and consider its use in IT solutions. The Lenovo® Flex System SI4091 10Gb System Interconnect Module enables simplified, low-cost integration of Flex System™ into your networking infrastructure. The SI4091 requires no management for most data center environments, which eliminates the need to configure each networking device or individual ports, thus reducing the number of management points. It provides a low latency, loop-free interface that does not rely upon spanning tree protocols, which removes one of the greatest deployment and management complexities of a traditional switch. The SI4091 offers administrators a simplified deployment experience while maintaining the performance of intra-chassis connectivity. The Flex System Fabric SI4091 System Interconnect Module is shown in the following figure. The SI4091 provides transparent Flex System connectivity to your Cisco, Juniper, or other vendor network. The SI4091 aggregates compute node ports by appearing as a simple pass-thru device. The upstream network sees a “large pipe” of server traffic coming to and from the chassis, with the main difference being that intra-chassis switching is supported. With the SI4091, a network administration team continues to use the same network management tools that are deployed in the network to manage the connectivity from the physical servers in the chassis to the upstream network. With support for Converged Enhanced Ethernet (CEE), the SI4091 can be used as an FCoE transit device. It also is ideal for network-attached storage (NAS) and iSCSI environments. Customers who want simple 10 GbE network connectivity from the chassis to the upstream network, without the complexity of spanning tree and other advanced Layer 2 and Layer 3 features. Customers who want to manage physical compute node connectivity in the chassis by using the existing network management tools. Customers who want to reduce total cost of ownership (TCO) and improve performance, while maintaining high levels of availability and security. Customers who want to minimize oversubscription, which can result in congestion and loss of performance. Customers who want to implement a converged infrastructure with NAS, iSCSI, or FCoE. For FCoE implementations, the SI4091 passes through FCoE traffic upstream to other devices (such as the Lenovo RackSwitch™ G8264CS) where the FC traffic is broken out. With the growth of virtualization and the evolution of cloud computing, many of today’s applications require low latency and high-bandwidth performance. The SI4091 supports sub-microsecond latency and up to 480 Gbps throughput, while delivering full line rate performance. The SI4091 also offers increased security and performance advantage when configured in VLAN-aware mode; it does not force communications upstream into the network, which reduces latency and generates less network traffic. The SI4091 simplifies the deployment of a converged LAN and SAN with support for the newest protocols, including Data Center Bridging/Converged Enhanced Ethernet (DCB/CEE), which can be used in a converged iSCSI, Fibre Channel over Ethernet (FCoE) or NAS environment. The default configuration of the SI4091 requires little or no management for most data center environments, which eliminates the need to configure each device or individual ports and reduces the number of management points. Transparent networking The SI4091 is a transparent network device that is invisible to the upstream network and eliminates network administration concerns of Spanning Tree Protocol configuration and interoperability, VLAN assignments, and avoidance of possible loops. By emulating a host NIC to the data center core, it accelerates the provisioning of virtual machines (VMs) by eliminating the need to configure the typical access switch parameters. The front panel of the Flex System SI4091 10Gb System Interconnect Module is shown in the following figure. 10x SFP/SFP+ ports to attach SFP/SFP+ transceivers for 1 GbE or 10 GbE connections or SFP+ DAC cables for 10 GbE connections. One mini-USB RS-232 console port that provides another means to configure the interconnect module. 1x RJ-45 1 GbE port for out-of-band management. System LEDs that display the status of the interconnect module and the network. The following table lists the SI4091 system specifications. Layer 2 switching, virtual local area networks (VLANs), VLAN tagging, link aggregation (trunk) groups (LAGs), Hot Links, Layer 2 failover, Quality of Service (QoS), IPv4/IPv6 management, Converged Enhanced Ethernet, Fibre Channel over Ethernet (FCoE) transit switch operations. Management ports 2x GbE internal ports connected to the chassis management module; 1x 10/100/1000 Mb Ethernet external port (RJ-45); 1x RS-232 external port (Mini-USB). Management interfaces Industry standard command line interface (isCLI); SNMP v1 and v3. Optional Lenovo Switch Center. Optional Lenovo XClarity. Security features Secure Shell (SSH); Secure FTP (sFTP); user level security; LDAP, RADIUS, and TACACS+ authentication; access control lists (ACLs). Warranty One-year customer-replaceable unit limited warranty. When installed in a supported chassis, the module assumes the chassis’ base warranty and any warranty service upgrade; warranty includes Networking OS software upgrades. Mean Time Between Failures 261,636 hours with ambient operating temperature of 40° C.
The part number and feature code for ordering the SI4091 module are listed in the following table. Note: SFP/SFP+ transceivers and DAC cables are not included and should be ordered together with the interconnect module (see Transceivers and cables for details). The interconnect module does not include a serial management cable; the optional Flex System Management Serial Access Cable (part number 90Y9338) is supported and includes two cables: a mini-USB-to-RJ45 serial cable and a mini-USB-to-DB9 serial cable, either of which can be used to connect to the interconnect module locally for configuration tasks and firmware updates. For 1 GbE links, customers can use RJ-45 SFP transceivers with UTP cables up to 100 meters. Customers that need longer distances can use a 1000BASE-SX transceiver, which can drive distances up to 220 meters with 62.5 µ multimode fiber (OM1) and up to 550 meters with 50 µ multimode fiber (OM2), or the 1000BASE-LX transceivers that support distances up to 10 kilometers with single-mode fiber (1310 nm). For 10 GbE links, customers can use SFP+ direct-attached copper (DAC) cables for in-rack cabling for distances up to 7 meters or SFP+ active optical cables (AOCs) for distances up to 20 meters. These cables have SFP+ connectors on each end, and they do not need separate transceivers. For distances up to 30 meters, the 10GBASE-T SFP+ transceiver can be used with Category 6a or 7 RJ-45 UTP cables. The supported transceivers and cables are listed in the following table. The network cables that can be used with the SI4091 are listed in the following table. Note: The features and specifications that are listed in this section are based on Networking OS version 8.4. In VLAN-agnostic mode (default configuration), the SI4091 transparently forwards VLAN tagged frames without filtering on the customer VLAN tag, which provides an end host view to the upstream network. The interconnect module provides traffic consolidation in the chassis to minimize TOR port utilization. It also enables compute node-to-compute node communication for optimum performance (for example, vMotion). It can be connected to the FCoE transit switch or FCoE gateway (FC Forwarder) device. In VLAN-aware mode (optional configuration), the SI4091 provides more security for multi-tenant environments by extending client VLAN traffic isolation to the interconnect module and its external ports. VLAN-based access control lists (ACLs) can be configured on the SI4091. When FCoE is used, the SI4091 operates as an FCoE transit switch, and it should be connected to the FCF device. Layer 2 Trunk Failover to support active/standby configurations of NIC teaming on compute nodes. Hot Links provide basic link redundancy and fast recovery for network topologies without a need for Spanning Tree protocol. VLAN-based access control lists (ACLs) (VLAN-aware mode). Multiple user IDs and passwords. Radius, TACACS+, and LDAP authentication and authorization. Quality of service (QoS): Support for IEEE 802.1p traffic classification and processing. Priority-Based Flow Control (PFC) (IEEE 802.1Qbb) extends 802.3x standard flow control to allow the module to pause traffic that is based on the 802.1p priority value in each packet’s VLAN tag. The SI4091 carries a 1-year, customer-replaceable unit (CRU) limited warranty. When installed in a supported chassis, these I/O modules assume your system’s base warranty and any warranty service upgrade. 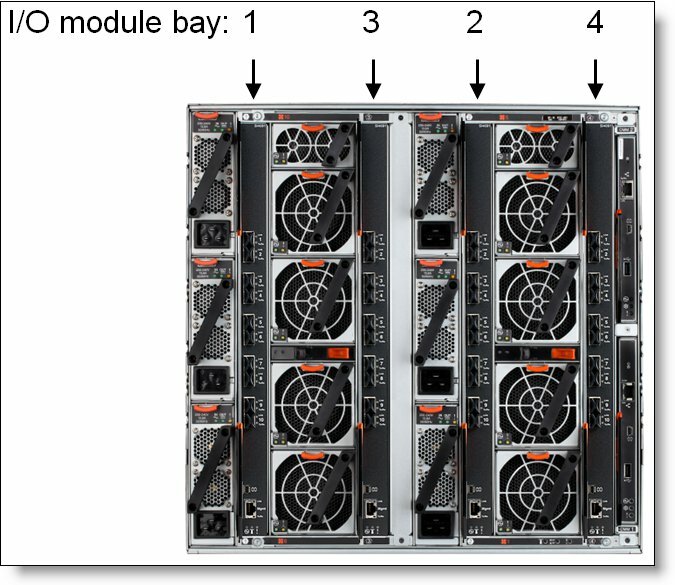 The I/O modules are installed in I/O bays in the rear of the Flex System Chassis, as shown in the following figure. I/O modules are typically installed in pairs because ports on the I/O adapters that are installed in the compute nodes are routed to two I/O bays for redundancy and performance. The SI4091 interconnect modules can be installed in bays 1, 2, 3, and 4 of the Flex System chassis. A supported adapter must be installed in the corresponding slot of the compute node. Although an adapter can use up to four ports to connect to the respective I/O module bay, the SI4091 can use only one of the four ports. In compute nodes that have an integrated dual-port 10 GbE network interface controller (NIC), NIC ports are routed to bays 1 and 2 with a specialized periscope connector (the adapter card is not required). However, the periscope connector can be replaced with the adapter when needed. In such a case, integrated NIC is disabled. The following table shows compatibility information for the SI4091 and Flex System chassis. The following table lists the adapters that are supported by the I/O module. † The Embedded 10Gb Virtual Fabric Adapter is built into selected compute nodes. ** The Embedded 1 Gb Ethernet controller is built into selected compute nodes. The most common SI4091 connectivity topology, which can be used with both Lenovo and non-Lenovo upstream network devices, is shown in the following figure. In this loop-free redundant topology, each SI4091 is physically connected to a separate Top-of-Rack (ToR) switch with static or LACP aggregated links. When the SI4091 is used with the Lenovo RackSwitch switches, Virtual Link Aggregation Groups (vLAGs) can be used for load balancing and redundancy purposes. 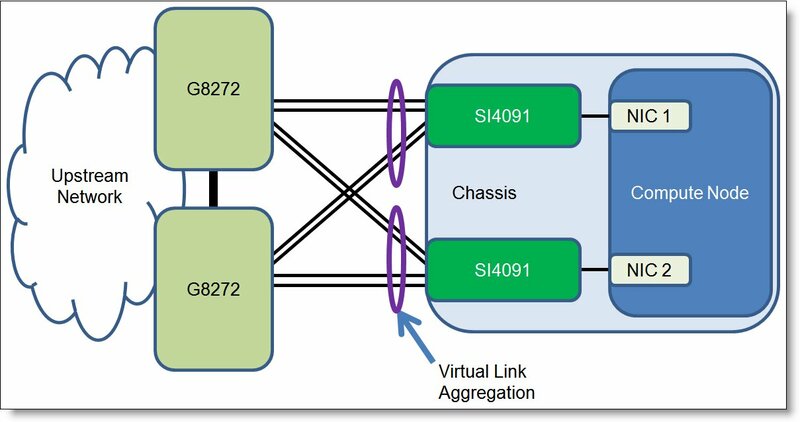 The virtual link aggregation topology with the Lenovo RackSwitch G8272 is shown in the following figure. In this loop-free topology, aggregation is split between two physical switches, which appear as a single logical switch. Each SI4091 is connected to ToR switches through static or LACP aggregated links. Dual isolated SAN fabrics: If you plan to use FCoE in a dual isolated SAN fabric design approach (also known as SAN air gaps), consider the SI4091 connectivity topology shown in Figure 4 (Link Aggregation). The following table lists the 10 Gb Ethernet network switches that are offered by Lenovo that can be used with the SI4091 interconnect module in Flex System network connectivity solutions. * The SI4091 supports FCoE transit switch operations when connected to the RackSwitch G8264CS. The SI4091 interconnect module can be used for external NAS, iSCSI, or FCoE SAN storage connectivity. The following table lists the external storage systems that are offered by Lenovo that can be used with the SI4091 interconnect module in storage connectivity solutions. For FCoE storage connectivity, the SI4091 interconnect module transports encapsulated FCoE packets to the Fibre Channel Forwarder (FCF), which provides end-to-end 10 Gb FCoE connectivity for storage systems with native FCoE ports or FCoE/FC gateway connectivity for storage systems with native FC ports.